Cerazette is a progesterone-only contraceptive pill. Order new or repeat courses of Cerazette online - our service is fast, discreet and confidential. Unlike combined pills, which are taken for 3 weeks followed by a 7 day break, there is no pill-free period with Cerazette. You need to take Cerazette every day for it to work. It is best to take the pill at the same time everyday. Set up a daily routine and don’t delay taking your pill so that it is effective. That said, unlike most minipills, Cerazette works if you take it within 12 hours of your normal time. The individual pills on each Cerazette packet are labelled with the days of a week to help you keep track. When you begin using Cerazette, make sure you begin with the tablet for the correct day of the week and follow the arrows along the side when it’s time for the next dose. While most progesterone-only pills stop sperm from entering the womb, Cerazette also stops your body ovulating (releasing eggs). It works like a combined pill, even though it does not contain any oestrogen. Cerazette is therefore suitable for women who cannot take oestrogen, as well as women who are breastfeeding. It is also often recommended to women who smoke, are obese or who have an increased risk of thrombosis (blood clots) for other reasons. As long as you remember to take Cerazette within 12 hours of the time it was due, you are protected against pregnancy. Take the pill as soon as you remember and continue treatment at your usual time. If you miss a dose entirely and you remember more than 12 hours later, your pill might not work. In this case, you must take the missed dose immediately and the next pill at the time you normally would - even if this involves taking two Cerazette pills in one day. Then use an additional contraceptive, such as a condom, for seven days afterwards whilst you wait for the pill to build back up in your system. If you vomit within 3 to 4 hours of taking the pill, it may not have been absorbed properly. If this happens, you need to take another pill to ensure you are protected from pregnancy. Will I experience period bleeding with Cerazette? This varies between women. Some women say that they do not bleed at all while using the minipill, whereas others complain of ongoing spotting and bleeding. For some women, Cerazette can cause bleeding throughout the month. This does not mean that the pill is not working. Is there a risk of weight gain? Like most oral contraceptives, Cerazette can cause slight weight gain in some women. This side effect affects one in ten users. What’s in a Cerazette pill? 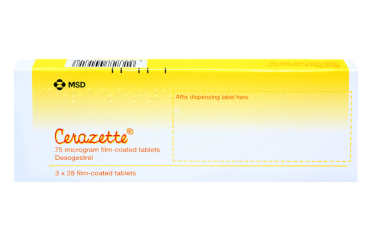 Each Cerazette pill contains 75 micrograms of progestogen desogestrel (this is the active part of the medicine).Other ingredients include all-rac-α-tocopherol, maize starch, colloidal anhydrous silica, povidone, stearic acid, macrogol 400, hypromellose, talc, lactose monohydrate and titanium dioxide (E171). Can you use Cerazette while breastfeeding? Cerazette is suitable for women who are breastfeeding and will not affect milk production or harm the baby. Does cerazette stop you ovulating? Most mini pills work by thickening the mucus at the entrance to the womb so that sperm can’t reach an egg and by changing the lining of the womb so that eggs can’t implant. Cerazette also prevents ovulation in most cases, which means that you are protected from pregnancy in three ways. Please see the patient information leaflet for more information. I am experiencing spotting - what can I do? Spotting is a common side effect in women who take Cerazette. As Cerazette is a mini pill, it is taken every day without a break. Instead of breakthrough bleeding once a month, women who use Cerazette often find that they experience spotting throughout the month or that they do not bleed at all. This doesn’t mean that Cerazette isn’t working and you don’t need to worry about it unless the bleeding bothers you or becomes unusually heavy. It is not unusual for spotting to occur during the first three months of taking Cerazette, while your body gets used to the pill. If any side effect causes serious discomfort or inconvenience or if any side effect continues after the first 3 month pack you should consult your doctor to discuss alternative contraceptives. Your doctor will take the time to assess your general health and medical history before prescribing Cerazette. It is important that you mention any medical problems or medications you are taking during this assessment. Certain antibiotics can stop contraceptive pills such as Cerazette from working. It is important that you tell your doctor that you are relying on the pill for contraception whenever you are prescribed a medication. The antibiotics rifampicin and rifabutin affect your contraceptive protection as they increase the amount of certain enzymes in your body, which have an effect on hormonal contraceptives. If you are prescribed either of these antibiotics while taking Cerazette, you need to use additional protection such as a condom for the duration of your antibiotic treatment and for up to 28 days after you have taken the last antibiotic tablet. Ask your prescribing doctor for exact instructions on how to take Cerazette during or after an antibiotic treatment. Fast service and fast delivery, more than happy! Very easy to place an order by answering a few questions, you're kept up to date at each stage, and it was very quick delivery. Superb service in all fairness, especially when I was due to run out of the pill and I couldn't get an appointment to see the nurse until November! Highly recommend this service. Quick and easy. Very pleased with the speed of service. Product was exactly what I needed! i usually get my prescription free from my doctor but due to working away from home needed a quick delivery without a trip to the doc's surgery... Being able to order this online really helped! Very easy to order online. The items came within 3 days of being ordered. Doctor looking over my order was thorough as I hadn't filled in my blood pressure question and sent an email to remind me to go to the pharmacy to get my blood pressure checked. Would definitely use the service again. Easy to use, good customer service & speedy delivery, will use again. Should have been made aware of Christmas delivery eta before ordering especially with something as important as contraception. Except for this service was great. Many thanks. I have used the product before and it has very few side effects.